The Internet of Things promises to add connectivity to everyday objects, affording a level of convenience that most will welcome with open arms. The hurdle that many are carelessly overlooking, however, is how to power such devices. Batteries are cumbersome and unsightly, leaving just one other possibility: wireless power. The promise of wireless power (or heck, even improved battery technology) is a unicorn of technology, right up there with the flying car. It sorta, kinda technically exists but let's get real - if the Internet of Things is to take off like most forecast, wireless power / charging must be involved. 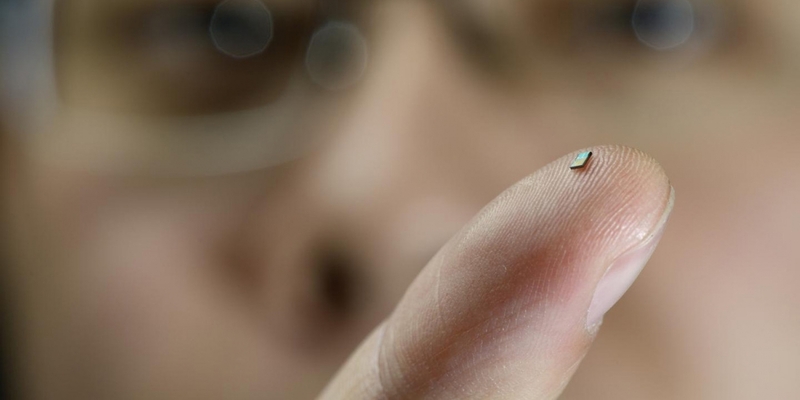 That said, Dutch researchers have developed a tiny wireless temperature sensor that's worth getting excited over. The sensor measures just two square millimeters in size meaning there's simply no room for charging wires or a traditional battery. Instead, the low-power sensor's antenna wirelessly captures energy from a nearby router and once enough has been gathered, it switches on and measures the temperature. That data is then beamed back to the router using a distinctive frequency depending on the temperature measured. The sensor is even capable of transmitting its signal from beneath a layer of paint, plastic or concrete. While it's certainly a step in the right direction, the sensor requires plenty of refinement before it can be used in practical applications. At present, it has a limited range (from the router) of just 2.5cm (around an inch) meaning it's not exactly practical today.